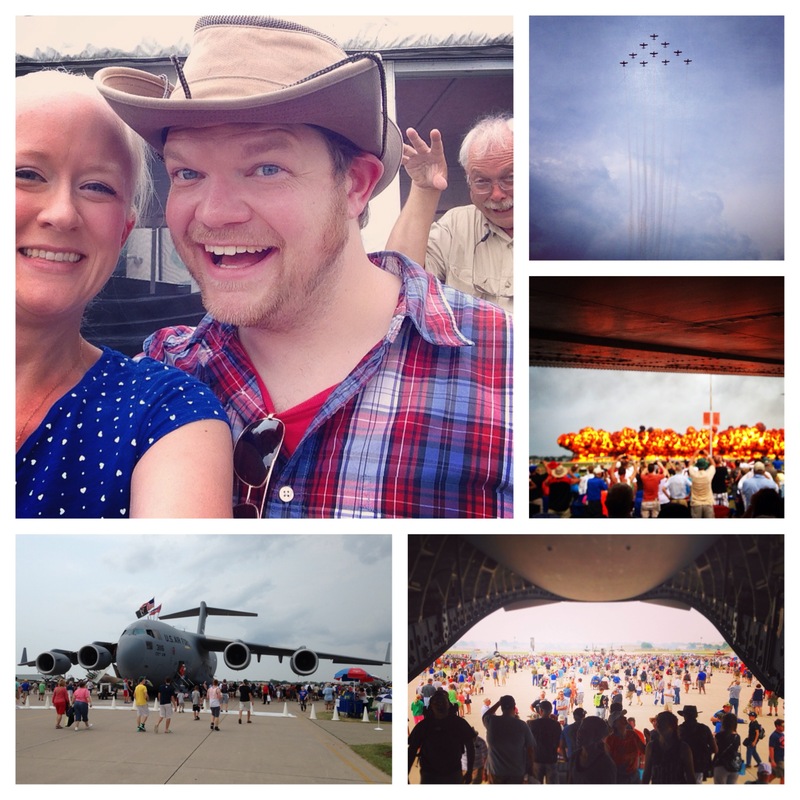 I’m so embarrassed that it has taken me so long to put up this post! 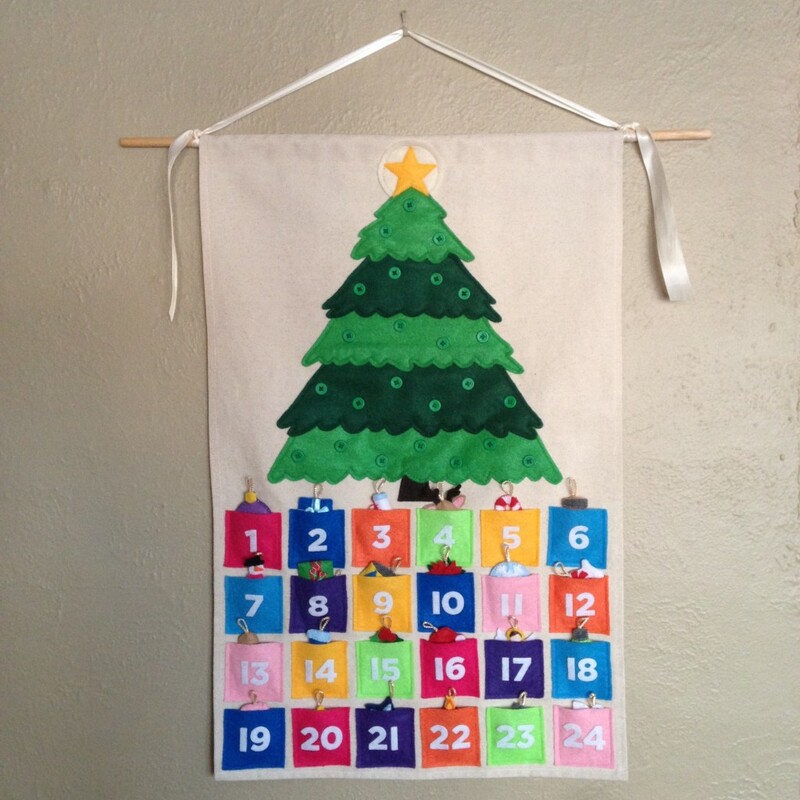 I have been very excited to share with you all of this year’s homemade Christmas presents. I start working on them right away in January/February because it means so much to me to be able to give from the heart. It’s a trait I’m sure I inherited from my grandmother, who loved to make things to give to others. As each of her 5 children went off to college, she knitted us a special afghan that I treasure (and can’t even bring myself to take out of the drawer!). Another project I finished over the summer was a book of my grandmother’s recipes. 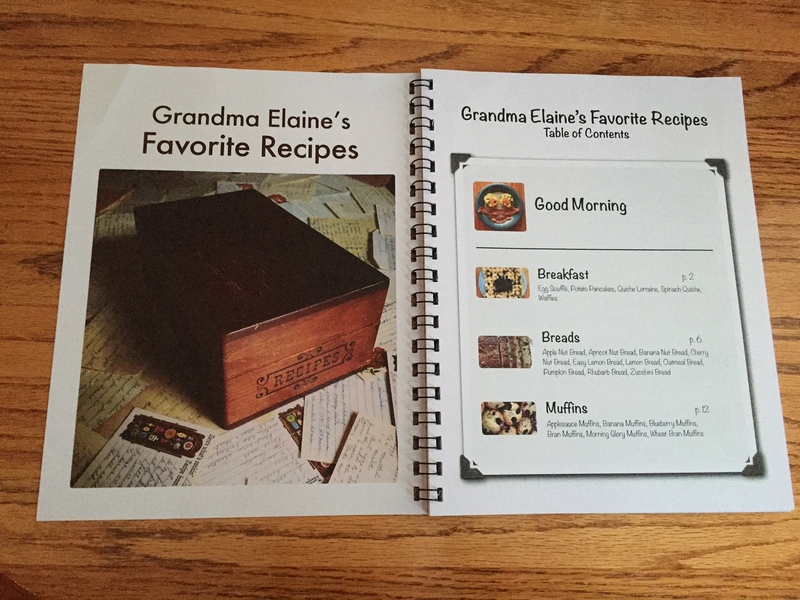 When she passed away, I asked for her recipe box and books. 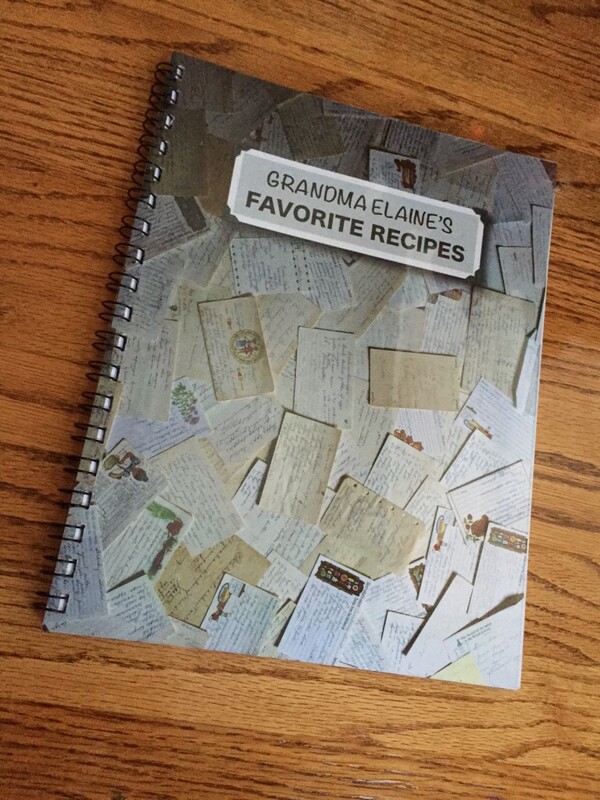 I spent countless hours pouring over the recipes, cherry-picking her favorites, separating them into categories, and typing them up. I spent the rest of the summer cooking many of the favorites to have pictures to include in the book. I also wrote a forward that attempts to capture what made her, and her cooking, so special. The final product was printed for brothers and sisters, each of her children, and grandchildren. I wrapped each book with love and hand delivered them on Christmas, and there were many, many tears. It wouldn’t be Christmas if it weren’t for our lovingly handmade treats, as well. 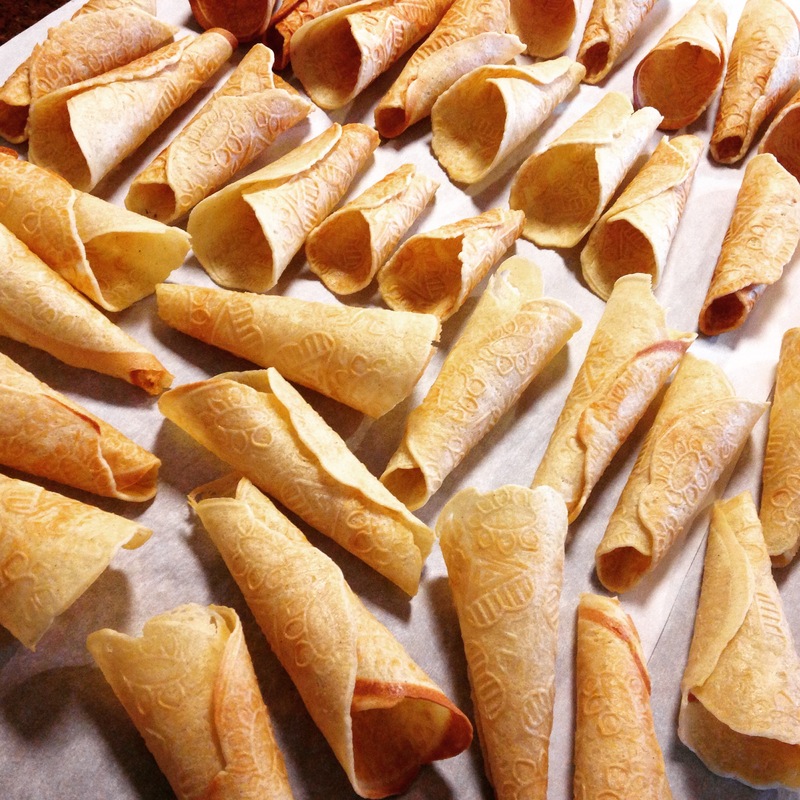 My mother, sister, and I spent an afternoon making Krumkake. 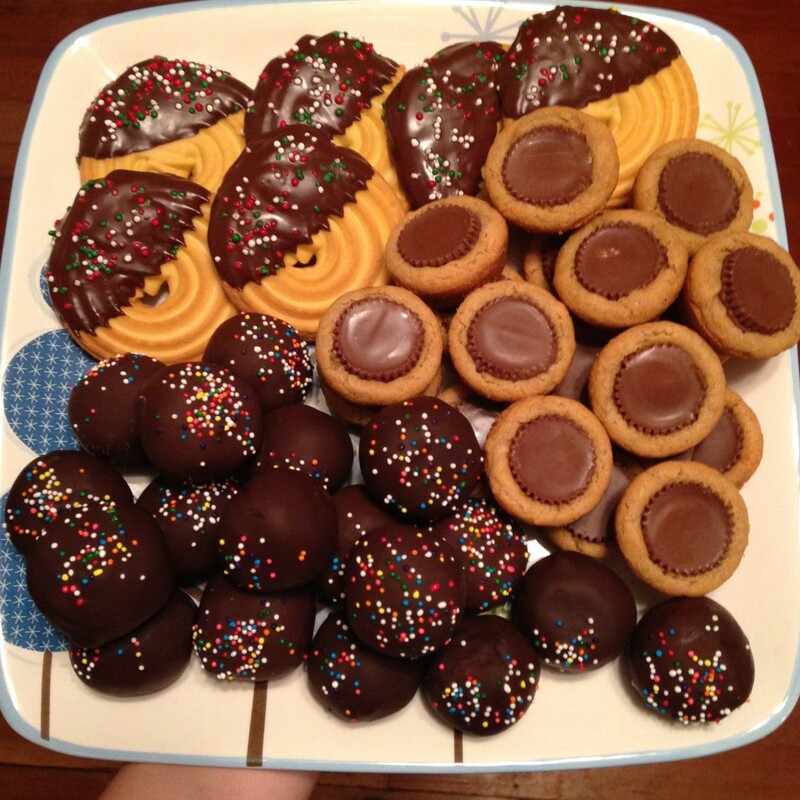 The plate of cookies below were made by yours truly, including chocolate-dipped shortbread, chocolate cakeballs, and peanut-butter cup cookies (are you sensing that I LOVE chocolate?). 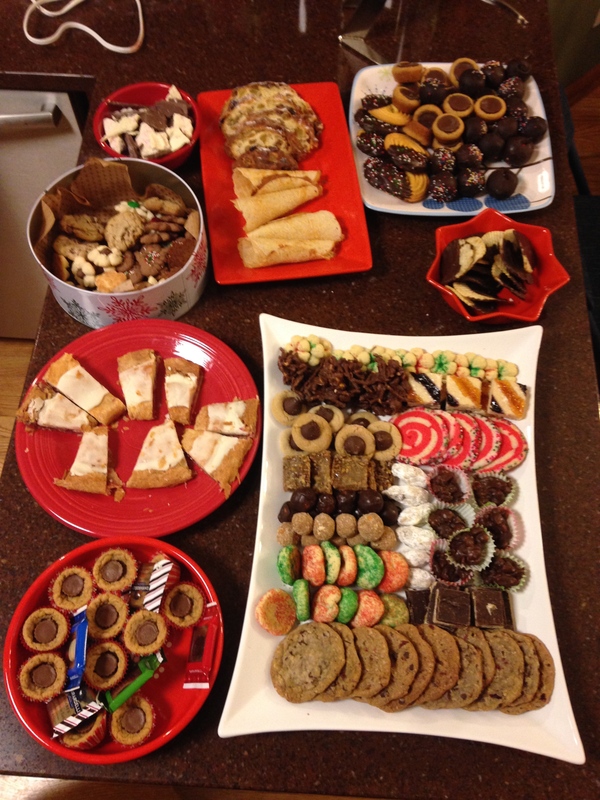 The final result is the gorgeous display of our family’s cookie haul. YUM! 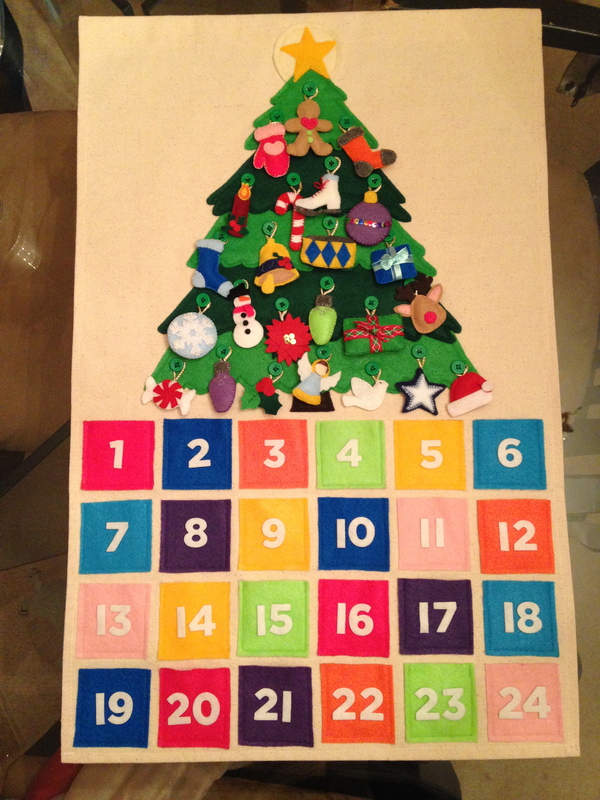 Last, but not least, I got a wonderful handmade surprise from my aunt on Christmas. She had found the pattern for my grandmother’s famous House Slippers. 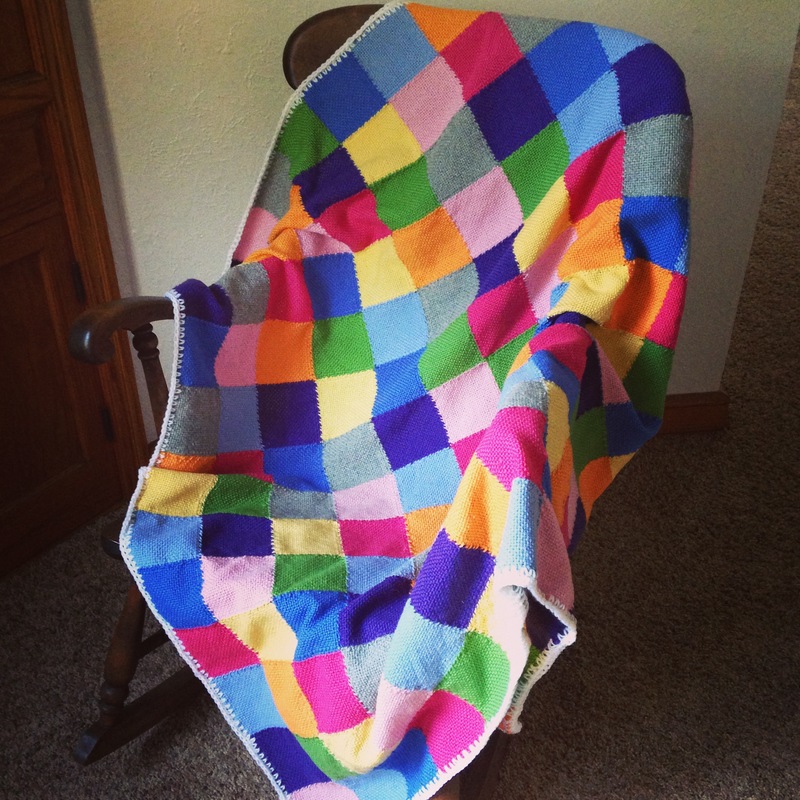 When you visited Grandma’s house, she always wanted to make sure you were warm enough. She insisted that you put on a pair of hand-knitted house slippers. I used to fight her on this and think they were big, clunky, and hideous. Then, over time, I grew to love them. I’d remind her if she forgot to have me put them on. When she passed away and we cleaned out her home, we all imagined we’d find a pair hidden in every nook and cranny of the house. Unfortunately, for unexplained reasons, we couldn’t find a single pair in the house. Had they walked off on their own? 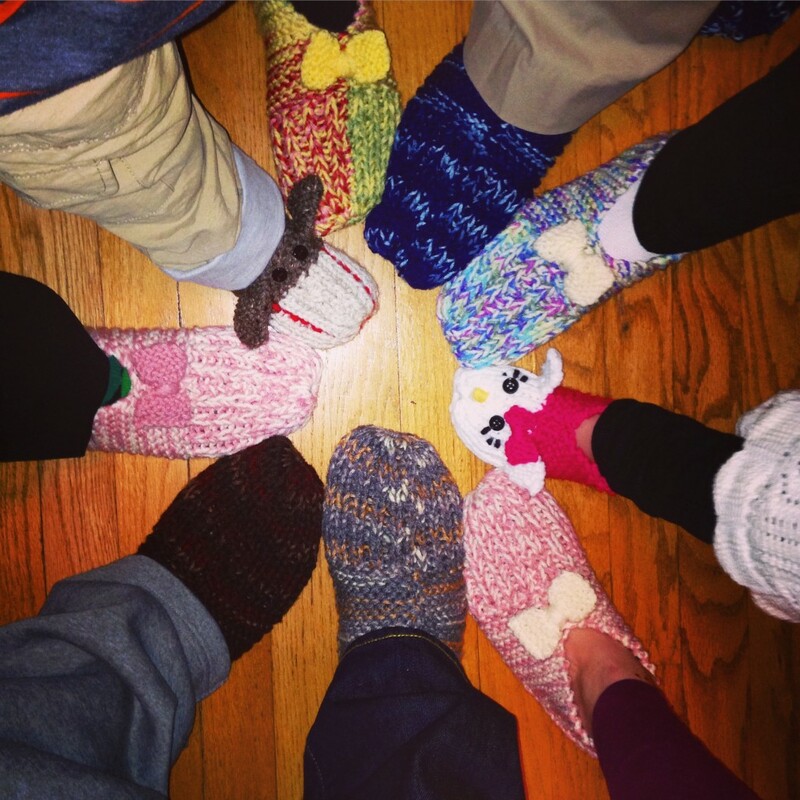 Well my aunt surprised us (all grand- and great-grand children) all by knitting us a personalized pair for Christmas – over 9 pair in total. More tears, for certain. I’m already hard at work on Christmas presents for next year. No, I will not give away my secrets and tell you what I’m up to! I guess you’ll just have to wait…. On this day last year, I made 14 New Year’s Resolutions to myself. It’s time to see how I did! 6. Stick with the Paleo diet 90/10 Well, for 10 months! So 9 and 3 halves out of 14 isn’t bad, is it? We did remodel the upstairs, but we decided not to get a tenant because we are moving. I didn’t purchase an elliptical for the same reason. And the Paleo diet? I kept up for 10 months but needed to stop for medical reasons. Parasailing would have been great, but I guess I just need to move that to my 2015 list! All in all, I am very pleased with my progress. I knew I was shooting for the stars with such an ambitious list, but if you don’t raise the bar, you never know what you can achieve! Speaking of 2015, it’s time to make a new list! This one will be very different. 5. Give more compliments – make people smile! 8. Get my bed back – no dogs! I’d love to hear about your goals, too! Anything scary? exciting? fun? challenging? important? 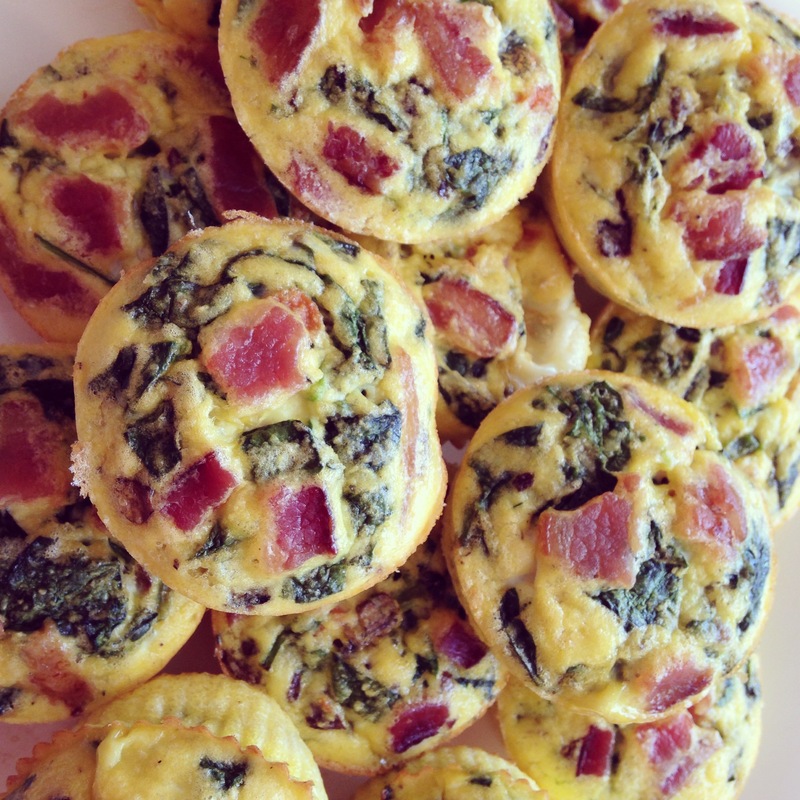 During the school year, these egg muffins are my staple go-to breakfast. I make a couple dozen on the weekend so they are ready to grab-and-go each morning. I’ve been asked to share the recipe more times than I can count, so I figured it was time for a blog post (with pictures!!!). The muffins are Paleo, which means dairy-free and grain-free. 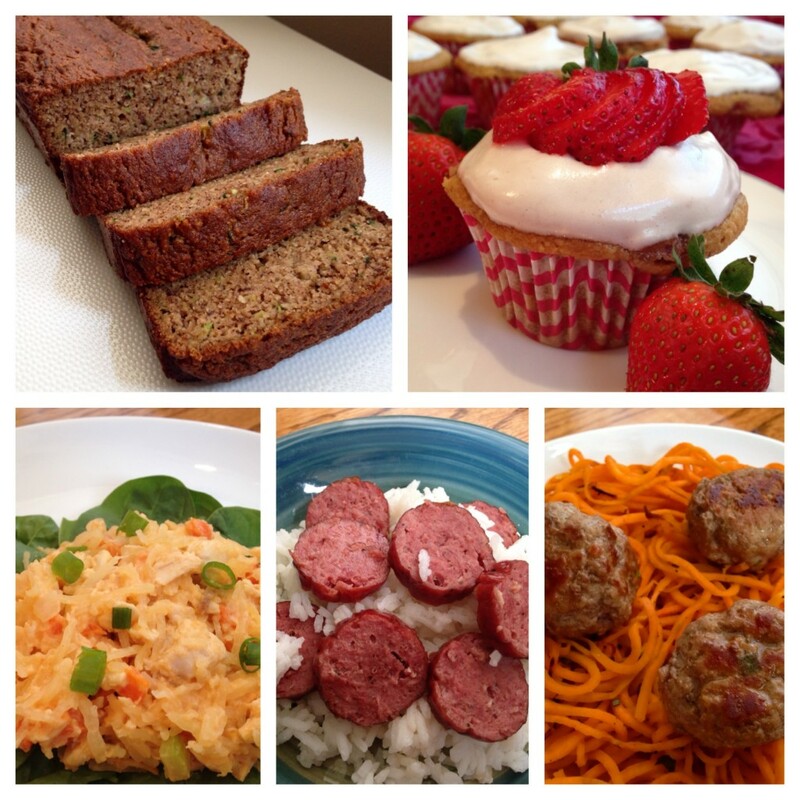 If you’re not into the Paleo scene, you can modify the recipe as you see fit (i.e. replace coconut milk with cow’s milk, or coconut flour with traditional flour). The beauty of this recipe is that it is very flexible, and I change it up regularly for variety. Step 3: Beat together the eggs, milk, lemon juice and zest, pepper, and flour. 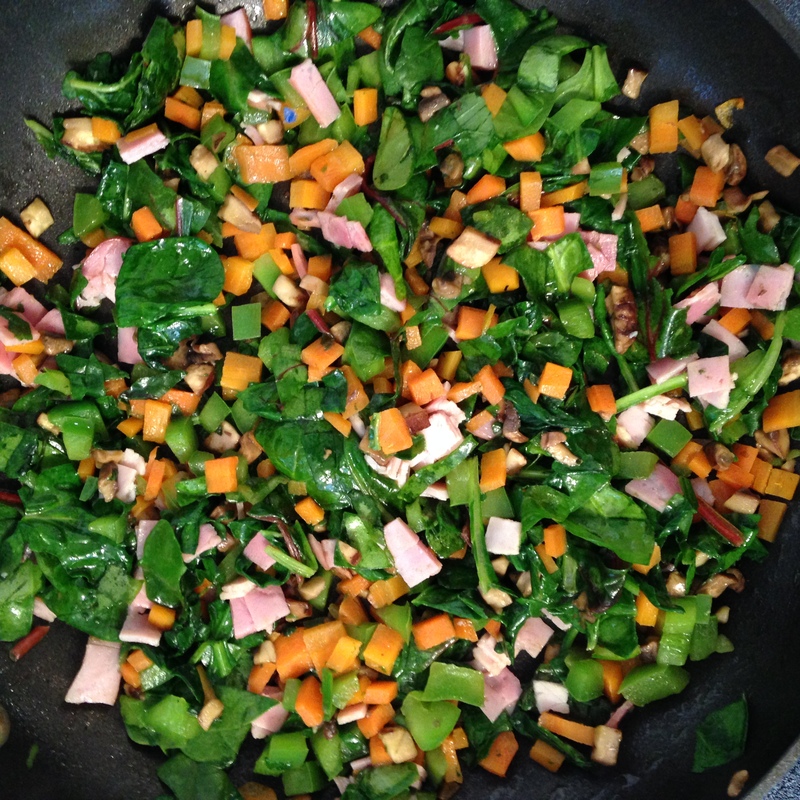 Then add in the sauteed vegetables. Step 4: Pour 1/4 cup of the mixture into greased muffin tins. 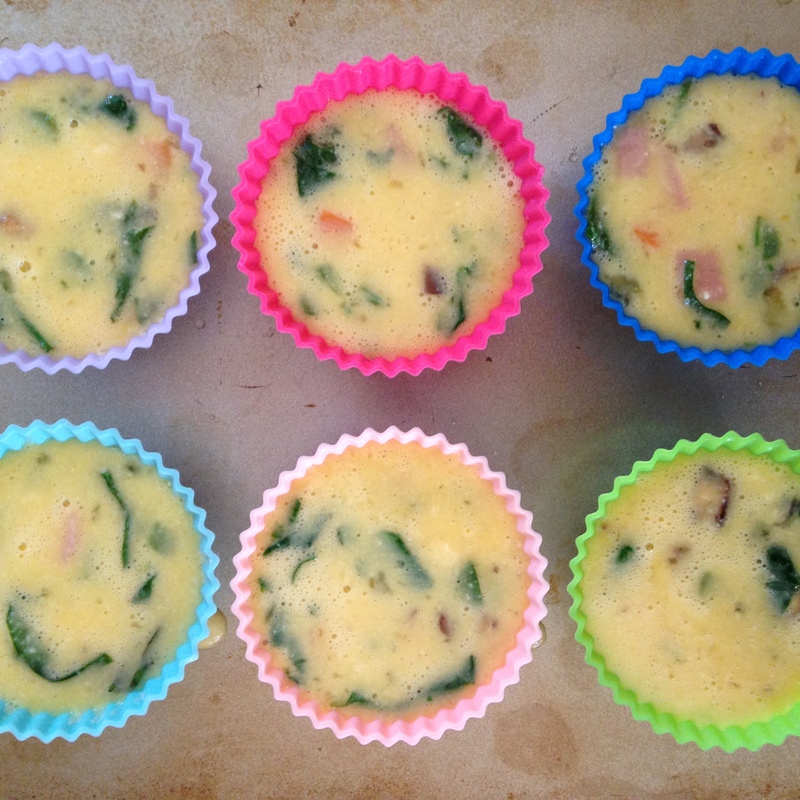 Pictured below are silicone muffin cups (non-stick). My husband enjoys adding hot sauce or tabasco, which is a fun flavor kick in the morning. If you are not strict Paleo, I imagine cheese would be another delicious topping. I grab 2 every morning, microwave at work, and enjoy for a very filling and tasty breakfast that lasts much longer than a bowl of cereal. I hope you enjoy this Team Dembro favorite recipe! Labor Day is approaching, which means the end of my summer. It was one of the BEST summer’s that I can remember! It was very fun, busy, and relaxing. Since I am no longer enrolled in school, I had more time to explore hobbies, visit with friends, and enjoy the weather. I came very close to completing my Summer Bucket List. That’s a good sign in my book – it wasn’t too hard or too easy, and it leaves me with a couple of items to add to my Fall Bucket List. Finishing my Zoom Loom Blanket. It turned out even better than I had hoped! 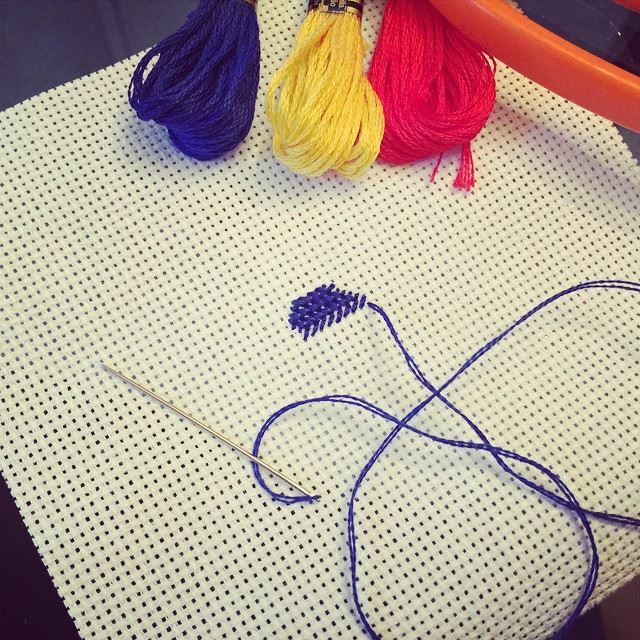 I even took a crochet class to add the border. 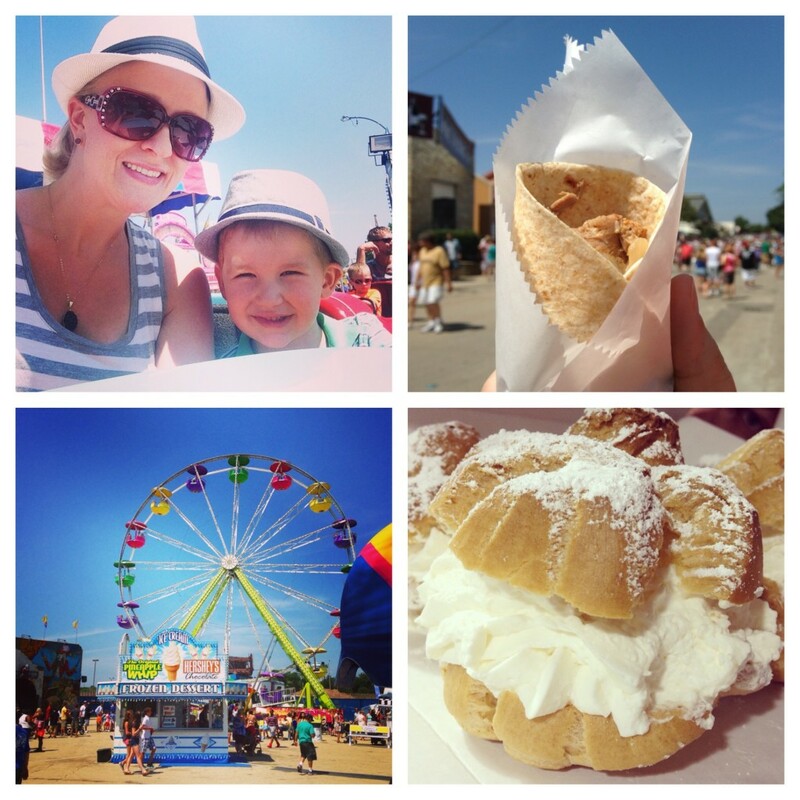 State Fair… with Cream Puffs! 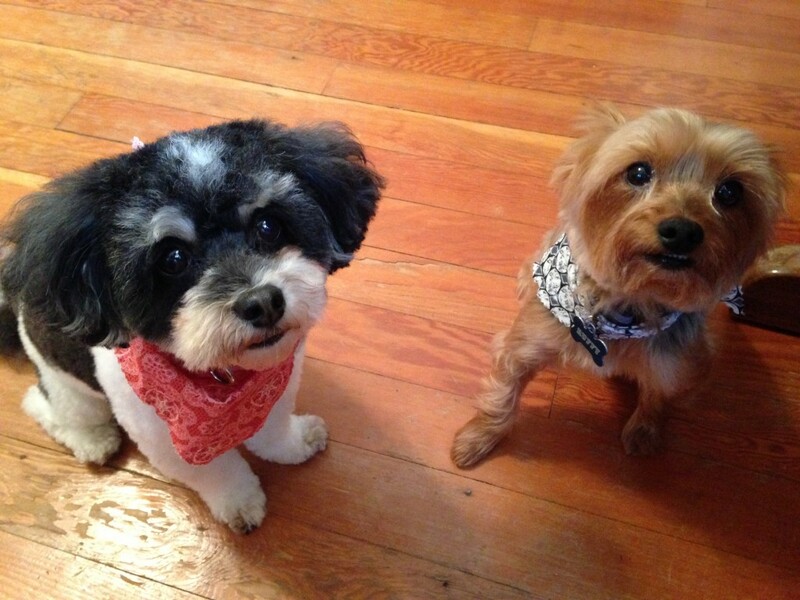 And spending time with these cutie pies! We took lots of walks and enjoyed the sun. 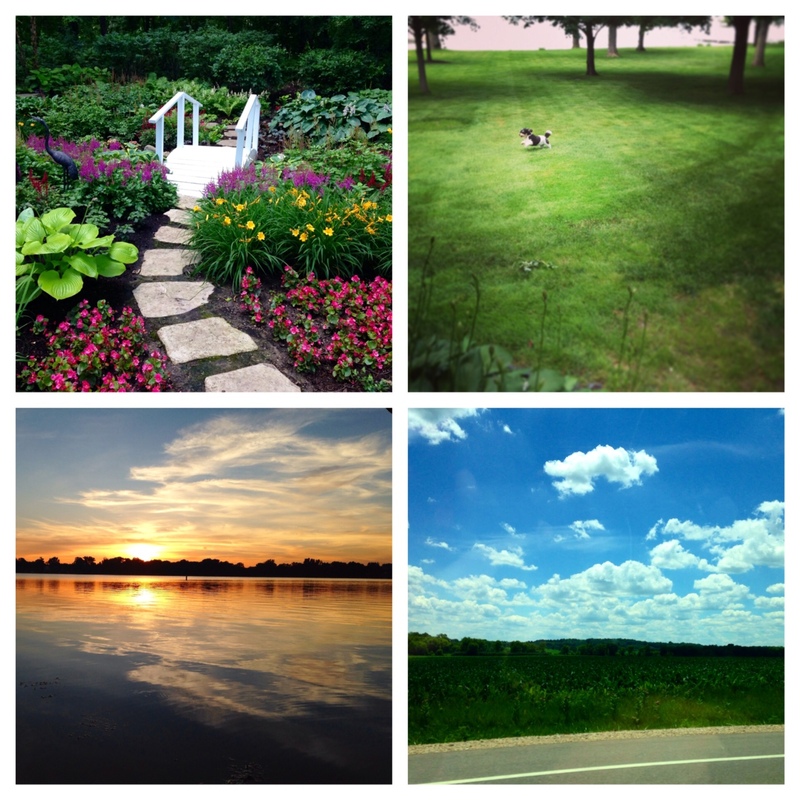 It was a wonderful summer and I wish it could go on forever. I hope you had a wonderful summer, too! Here’s to America, the Beautiful. Happy 238th! 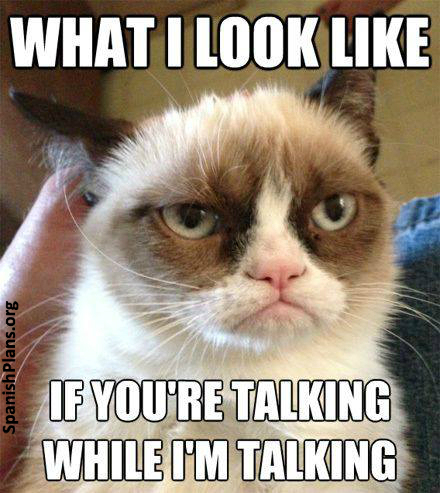 Fellow teachers, you will totally understand where I am coming from with this post. We get so excited for summer – not because we plan to sit around all day, but because we’ll finally have the time to catch up on all of the ‘life’ we miss out on during the school year. We get to take care of ourselves, take care of our homes, and reinvest in our relationships. I don’t know a single teacher who doesn’t push themselves even throughout the summer to be the best they can be. Most of us, in fact, continue to work on our teaching practice throughout the summer. We tutor, plan, research, collaborate, and create. I don’t stop thinking about my students and my classroom at all throughout 10 weeks. In fact, I will be doing something school related 5 days per week. The best part, of course, is that I get to sleep later, work at my own pace, and work anywhere I like (including my sunny backyard, the library, or a coffee shop). I have many things I’m really excited to do this summer. I also have things I know I need to accomplish. 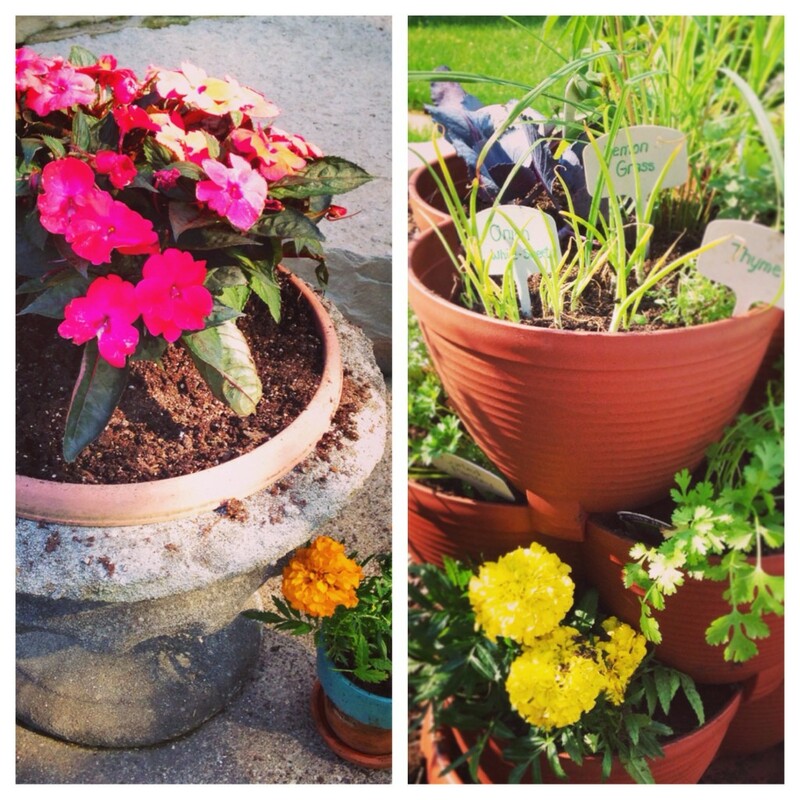 To ensure that I maintain a healthy balance, I’ve created a Summer Bucket list. I’m happy to share it with you. 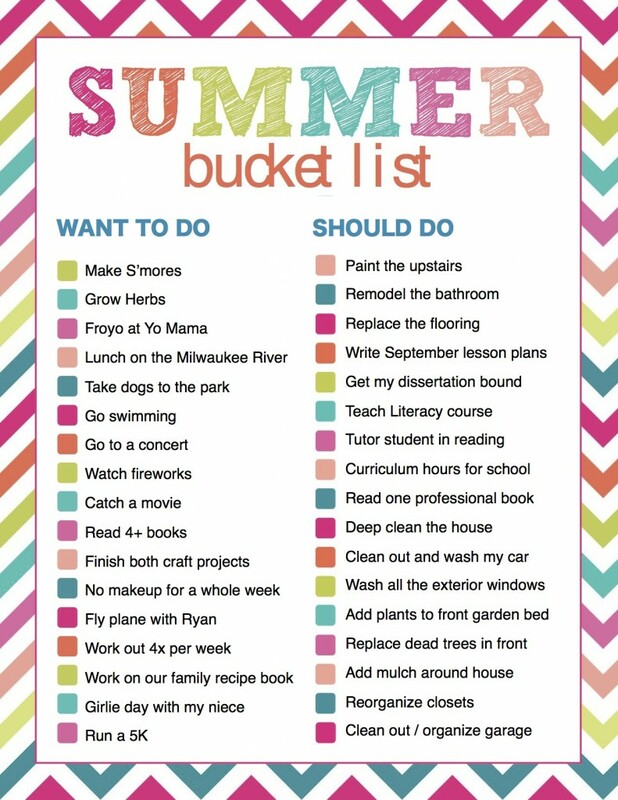 I’d love to hear about your summer goals, whether or not you are an educator. What are you most excited about? What do you hope to accomplish? 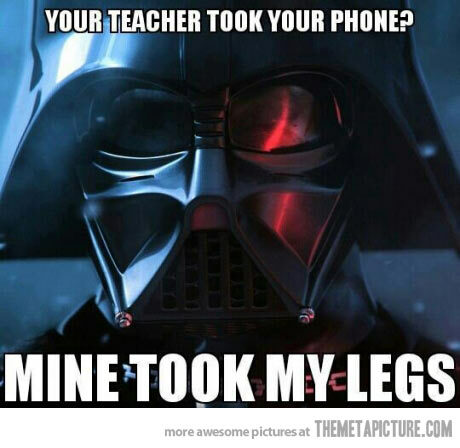 Yesterday was my last day in the classroom for the 2013-2014 school year. 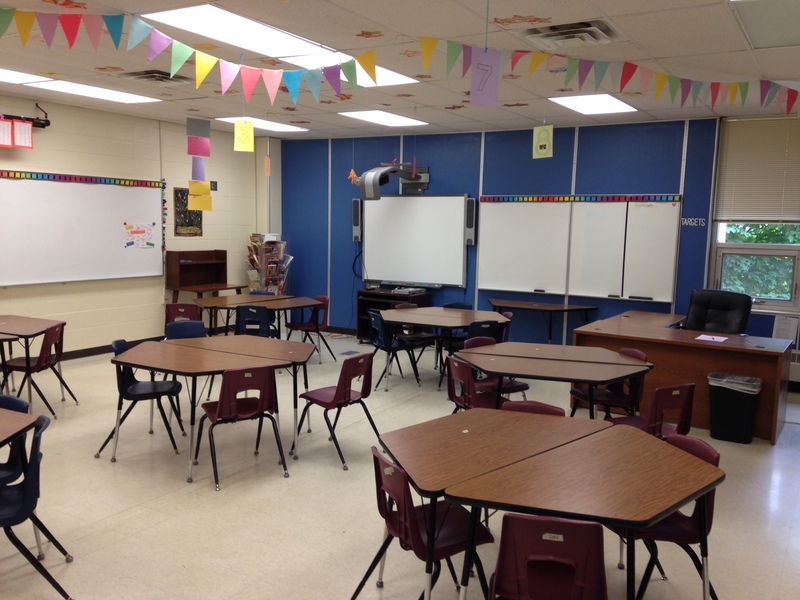 I said goodbye to my empty classroom for the summer. 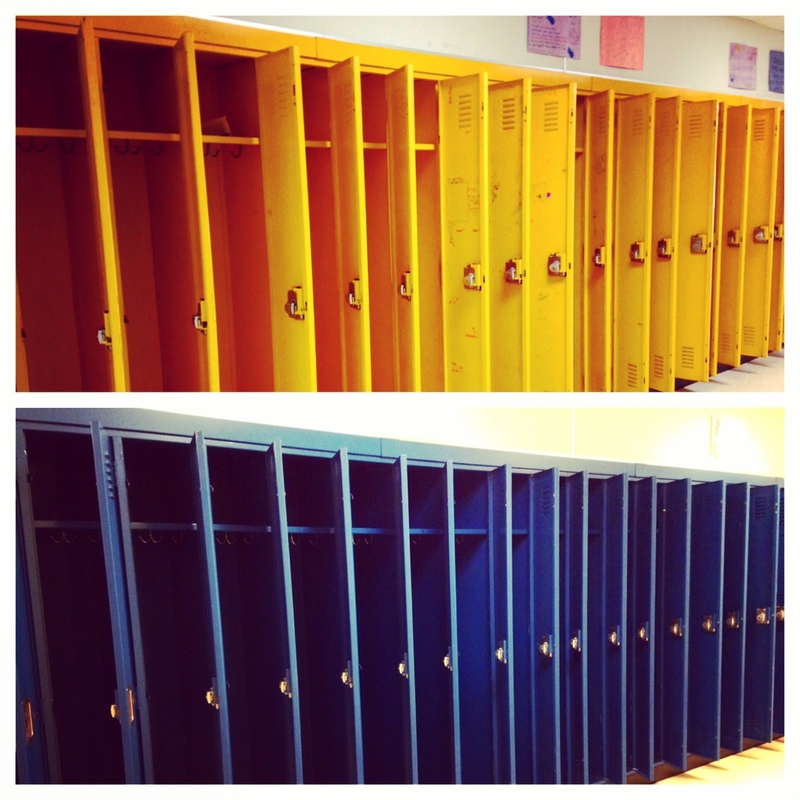 The lockers are empty, the hallways are eerily quiet, and my students are gone 🙁 I miss them already! At least my heart is full with the memories, and I look forward to them visiting me next year to tell me all about their freshman year (so glad our high school is just right across the street). I’ll still be posting throughout the summer. As a true teacher, I will never really stop working. I am teaching a college course on reading, tutoring a student, and researching writing workshop for curriculum hours over the summer. I’ll also be schooling myself in new reading interventions for the fall – I’ll be sure to post anything I think you’ll find interesting. I’m also excited to have somewhat of a life this summer! It’s just me and the two dogs with a whole lotta sunshine. I’ve got a huge stack of books to read, 2 summer crafting projects. an empty fridge that needs to be filled with my cooking, a basement that needs organizing, the gym I’ll be frequenting (so many classes I’m excited to try – especially Zumba! 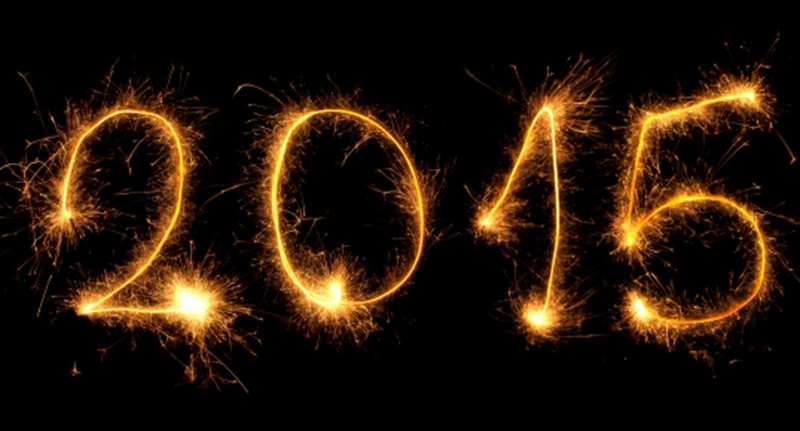 ), friends to visit, parties to have, movies to watch, and so much more. I’m thinking of making one of those summer bucket lists – I just love lists! Here’s to a great summer! BTW I’d love to hear your summer plans! Please let me know below. While in Delaware this weekend, we decided we simply HAD to visit Winterthur (pronounced Winter-tour or Wint-a-tour if you’re in a big ole’ hurry). Winterthur is a house museum of American material culture and handcrafted, decorative arts as well as a sprawling 60 acre garden. Winterthur was founded by Henry DuPont – yep, ‘the’ Dupont family with their vast family fortune. Mr. DuPont, who inherited Winterthur, lived from 1880 to 1969 and made Winterthur into the treasure it is today. During his lifetime, he expanded Winterthur into a 175-room mansion filled with historic architecture (that he had transported piece by piece from other historic houses across the United States) and decorative arts (such as George and Martha Washington’s china). There are 6 floors, and we toured the 2 floors that contained the DuPont’s living quarters and guest rooms. 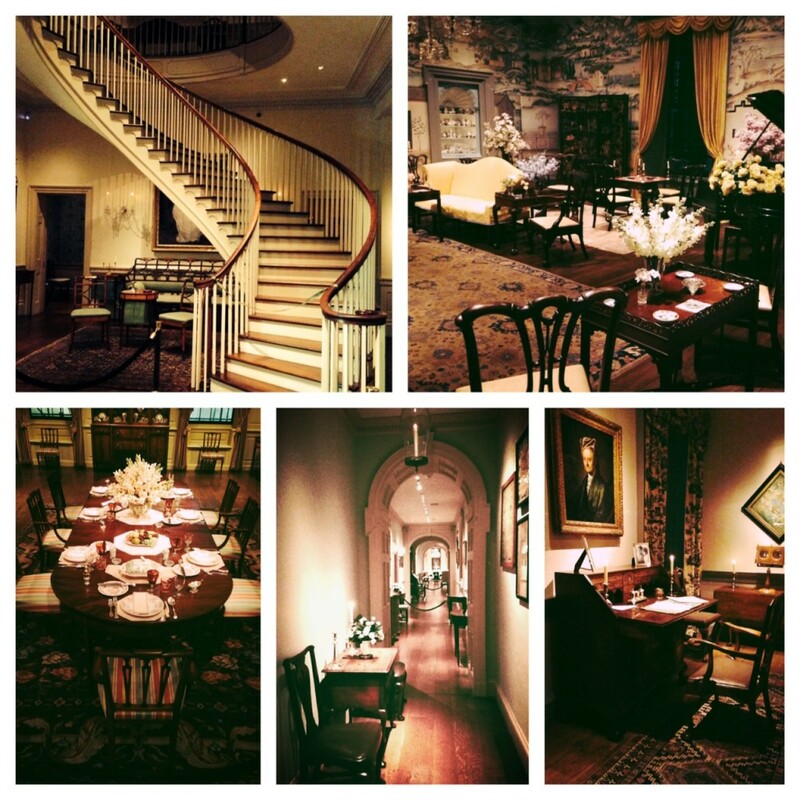 We viewed the grand double staircase, the sitting room where the DuPont’s enjoyed the wedding receptions of their two daughters, the dining room (the DuPont’s kept on staff one footmen for every two houseguests), several tea rooms and sitting rooms for playing bridge, pianos, fireplaces, and other beautiful bedrooms and staircases. Each room is exquisitely decorated. I loved learning that during the Great Depression, when many families had to part with their beloved family heirlooms, DuPont saw to it that – since he had the means and the desire – he rescued as many handmade and historical American artifacts as he could and painstakingly had everything restored and displayed within his museum/home. I’m certain you could spend days there and see barely a fraction of what this museum has to offer. Since my friend Erin and I are both Art History majors (and she is a curator of decorative arts and material culture at a museum), we were both completely geeking out at all the beauty. There were original American Chippendale furniture, wallpaper transferred from China, tea sets, handcrafted embroidery, original wood flooring, chandeliers imported from Europe, silver services, and so much more. 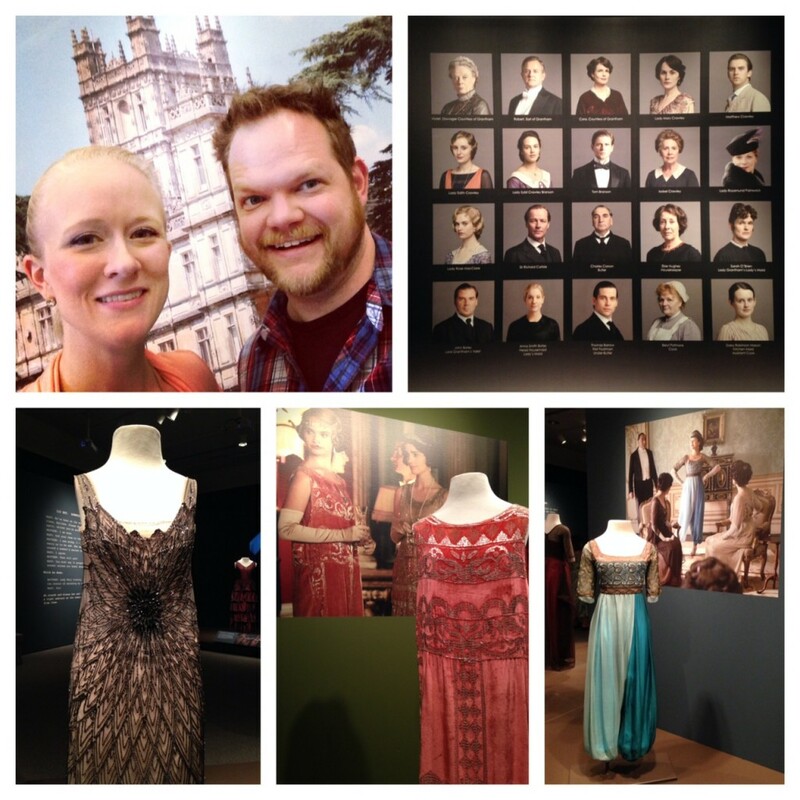 After our house tour, we visited the Downton Abbey exhibit. 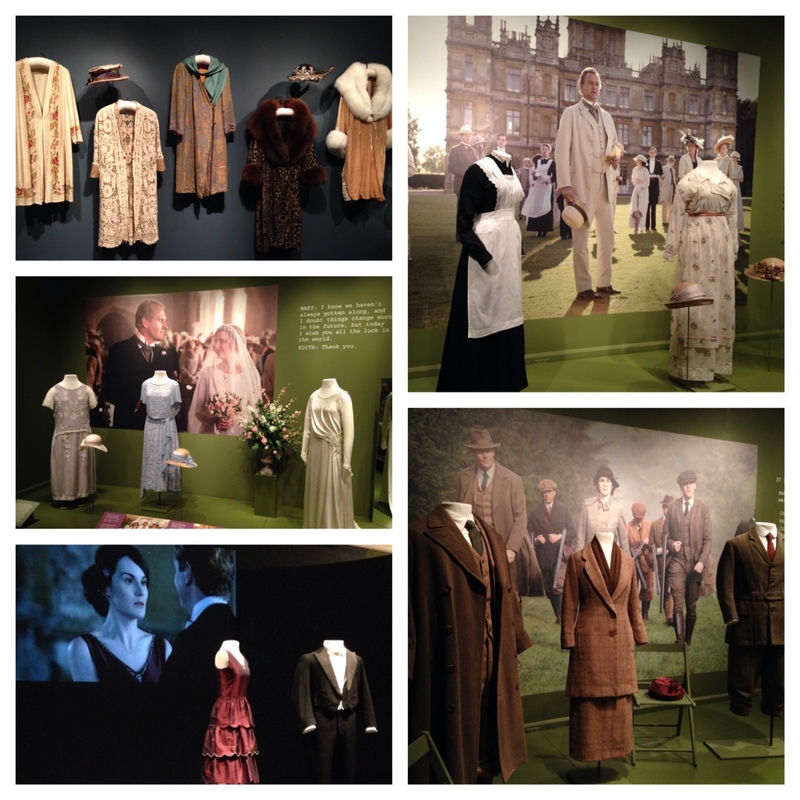 We learned that the director of Winterthur has a connection with the director of the Downton Abbey show on PBS, and he conceived and curated the idea for this Downton Abbey costume exhibit at Winterthur. It is not a traveling exhibit, and the costumes will be returning to England after this exhibition. We just HAD to go and see it! And I tell you, it did not disappoint. There were costumes from nearly every character on the show as well as detailed explanations of the meanings of colors, fabrics, cut, and style. It was interesting, for instance, to juxtapose the Flapper-inspired, controversial dress of Rose’s character with the dowdy and voluminous dresses sported by Isabelle Crawley – displayed just a few feet from one another. I also enjoyed how several displays incorporated a video projection of key scenes from the show in which the costumes were featured. One thing I learned, for instance, is that lavender is the color of mourning. This is why the women of Downton don lavender gowns to George’s christening, since Lady Sybil has recently passed. I also learned that women were required to wear corsets at all times (no big shocker there) except between the hours of 5pm and 7pm after a long day of outdoor sporting activities. She would have to endure the corset again for supper, but it’s nice to know ladies were granted a brief reprieve. After touring the house and Downton exhibit, we retired to the gardens for a few hours of leisurely strolling and sight seeing. DuPont was also a trained horticulturalist, and he designed each of the gardens, paths, and views throughout the 60 acre estate. The peonies were in full bloom, as were most of the azaleas. We enjoyed the Enchanted Woods, Pinetum, Azalea Walk, Reflecting Pool, Koi Pond, and many of the historic and impressively large trees (one is 250 years old!). The Enchanted Woods is adorable with little faerie homes, a giant bird nest, bridges inhabited by trolls, and a faerie circle of mushrooms – it is said that if children enter a faerie circle, they may disappear! (sensors produce a mist so the child appears to ‘disappear’ into thin air!). Everywhere you look there appears to be a bench or a perfect place to curl up and enjoy the view, have a picnic, or read a book. One story I enjoyed in particular was in regards to an old redwood tree on the property. At one point, the tree became diseased and might have died. DuPont – from his love of nature and preservation – decided to save the tree, so he called in an arborist. The arborist devised a plan that is akin to a root canal – he bored out all of the diseased interior of the trunk, flushed the cavity with a light bleach solution, then reinforced the tree with rebar and many tons of cement. The plan (though ridiculously expensive) worked, and the tree is still thriving to this day. 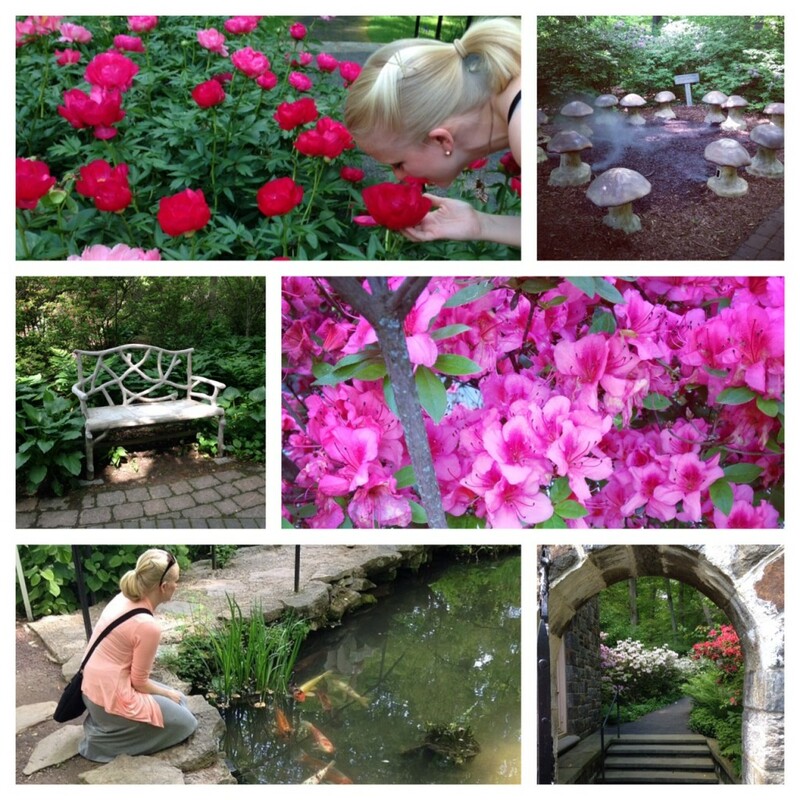 I would highly recommend that you visit Winterthur if you find yourself in Delaware – it is well worth the time and money. A guide suggested that mid-April would be the most beautiful time to visit, when many of the flowering plants will be in full bloom (such as the cherry trees). 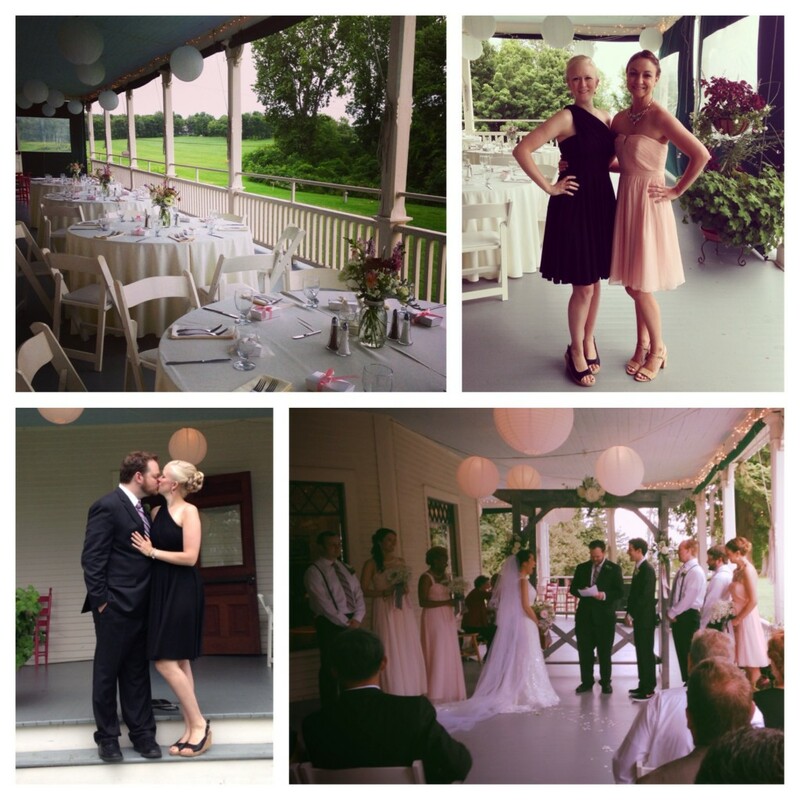 Ryan and I just returned from an absolutely adorable wedding in Delaware. 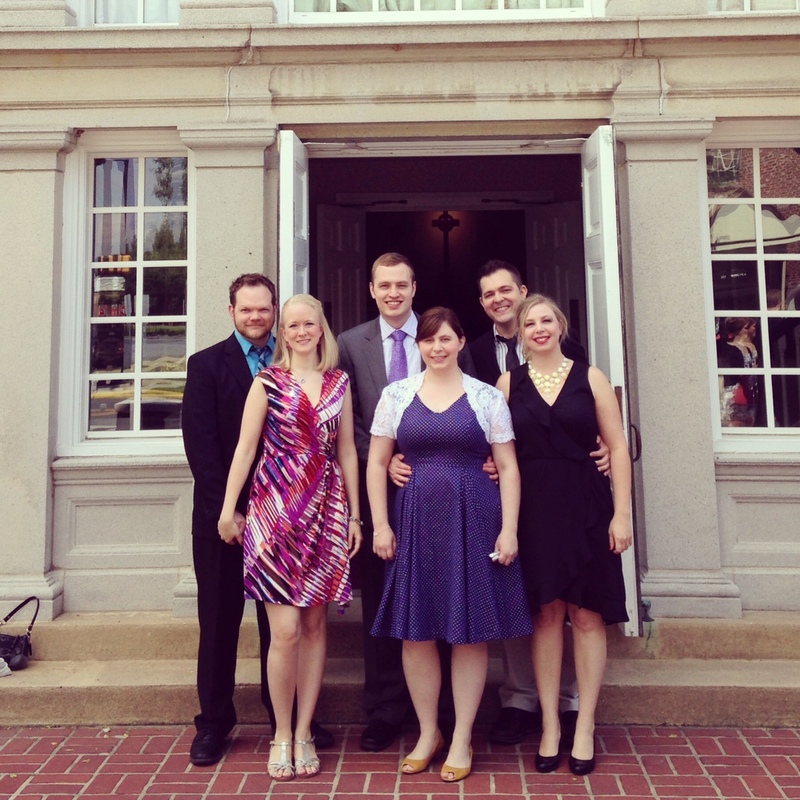 One of our very best friends from UWMadison, Dale, married the love of his life, Amy, in Dover. Dale is a geologist studying to get his doctorate in Delaware, and he is such a witty, loyal, generous person that anyone would be lucky to have as a friend. Amy is his perfect match – a sweet, caring, and equally witty sidekick. They are completely wonderful together! 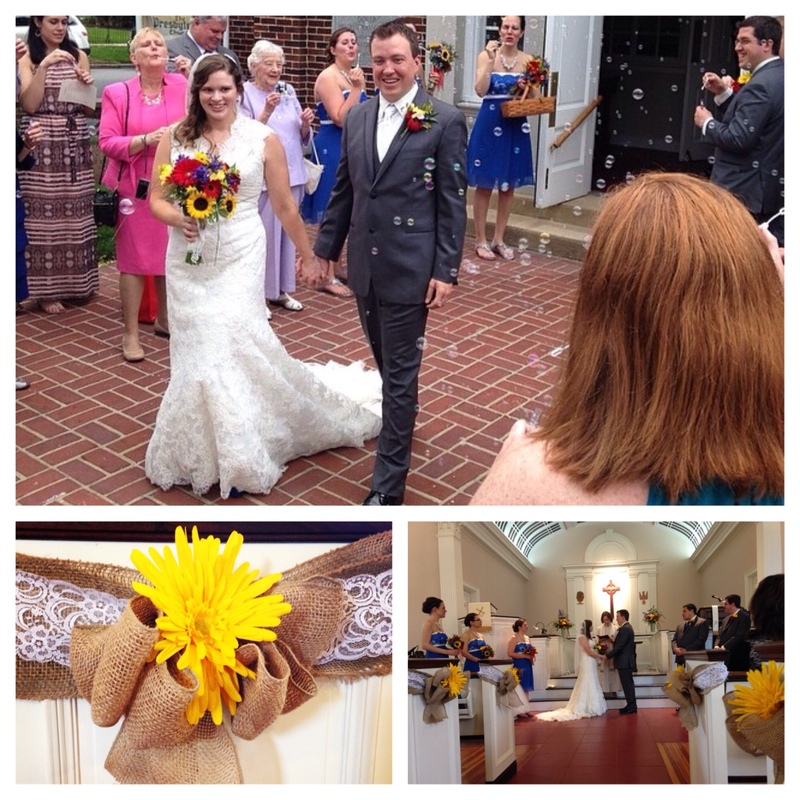 We had never been to Delaware, so it was a fun new adventure for Team Dembro. On our first night, we decided to be adventurous and visit a local seafood restaurant called Shucker’s Pier 13 (isn’t the East Coast known for it’s delicious Frutas del Mar?) I learned about a new seasoning called Old Bay. Listen, don’t make fun of me like our waiter for not knowing about it. We don’t have it in the Midwest! I also made sure I had the Crab Balls and New England Clam Chowder to get the full effect. Yum! One of my favorite parts about attending Dale and Amy’s wedding was getting to hang out with so any of our friends and family. We met up with Joe and Erin, our besties from undergrad, and Mike and Alicia, Ryan’s cousin and another super fun couple. I haven’t laughed SO HARD in SUCH a long time. I mean laughed so hard I had tears, and I did the ugly hyperventilating laugh. It was so great to catch up! Don’t we clean up nice? 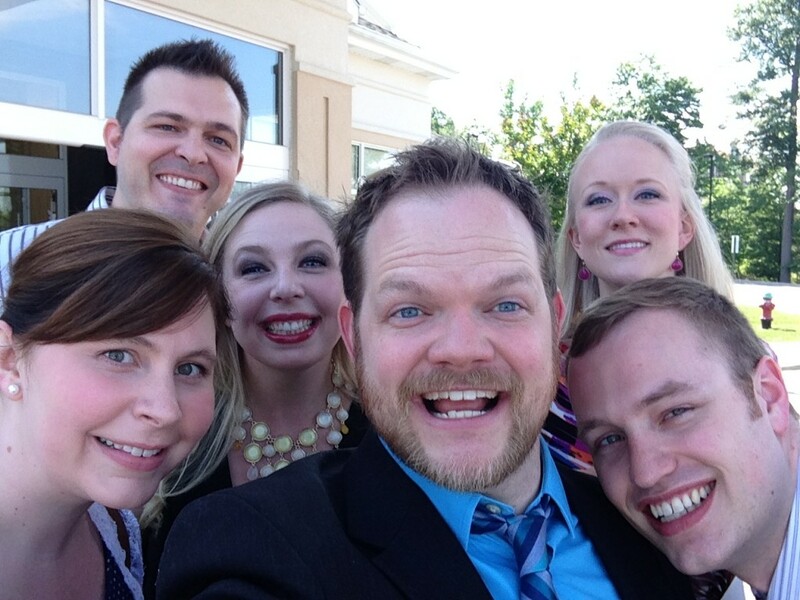 I love these people! We found a lovely local restaurant called Countrie Eatery. It was a quaint country breakfast joint right on the bay. We loved it so much that we ate there for two days in a row! I will also add that Delaware was not what I was expecting. Dover has some breathtaking historical architecture in some areas, and a laid back ‘big porch with a swing’ country feel in others. We saw sprawling fields and Amish communities tending livestock as well as more urban retail areas – what a mix! And I was pleasantly surprised by the laid back slightly southern drawl of the locals even though Delaware is what we might consider the ‘North.’ I am so glad that Dale has found such a lovely place to make roots and call home. I am heartsick already to realize that he won’t be coming ‘back’ to live (they’d better visit!) but equally excited for Amy and Dale’s new adventure.